Since 1934 Kovenz Memorial has been making quality granite memorials in our La Porte, IN Shop. We are dedicated to helping you design a lasting tribute for your loved one. When you are ready we would be happy to visit you in your home, in our office, or any time by appointment. A unique memorial lovingly tells a story in stone. If you live in the area please stop by one of our three locations for your convenience. Your loved one’s memorial is special and unique. The cost of the memorial you choose will depend on the stone, engraving, size, etc. Please contact us at one of our three locations to discuss the specific price of the memorial you are interested in purchasing. Bartholomew Funeral Home has been serving the community since 1892. They are Valparaiso’s oldest privately owned funeral establishment with a lounge, ample parking, chapel that will seat nearly 200 people, and video tributes of their loved one. 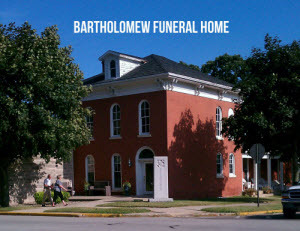 Bartholomew Funeral Home, Valparaiso’s oldest privately owned funeral establishment, has been serving the community since 1892. We understand that making the many decisions which come at a time of loss can be difficult. Whether you are experiencing a time of loss or have questions about pre-planning, we would like to offer our sympathy and support. Staff members of Bartholomew Funeral Home are caring and experienced professionals who understand that each family is unique and has personal requests and traditions. These requests and traditions are of utmost importance to our staff of licensed funeral directors. Click here to visit the Bartholomew Funeral Home website for more information about dealing with grief and loss, as well as a detailed section about pre-planning.